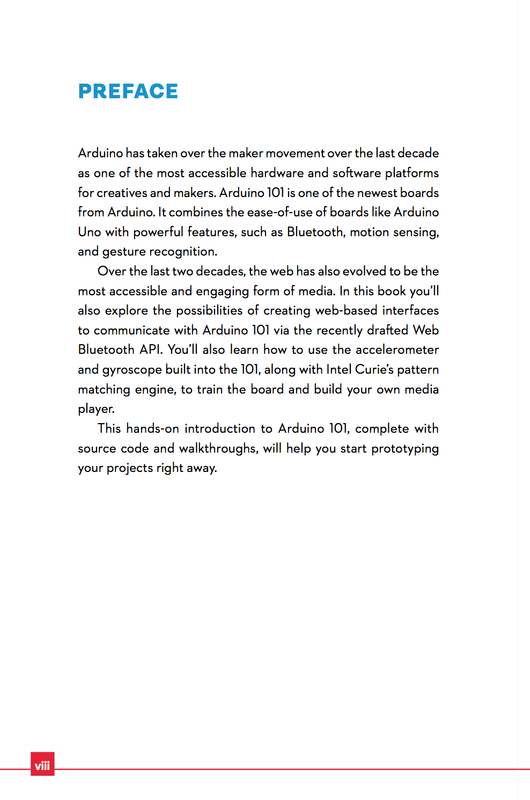 Jumpstarting the Arduino 101 is a book that helps you to get started with prototyping your Arduino 101 projects. I wrote this book with Sagar Mohite in 2017. This is a demo for Toggle an LED via a Chrome Browser project from Jumpstarting the Arduino 101 book from Make: media by Yining Shi. The browser is connected to Arduino 101 through Bluetooth LE. When input 1 or 0 in the input box on the web page and hit send, the LED on the Arduino 101 will light up or be turned off. This is a demo video for Controlling an interactive web page with your 101 project, from Jumpstarting the Arduino 101 book from Make: media by Yining Shi. When you tap or double tap the physical heart, Arduino 101 will detect the tap or double tap, and send data to the browser through Bluetooth LE, and the browser will show different visuals and play sound. This is a demo video for DIY BLE Gesture Recognition Media Player project, from Jumpstarting the Arduino 101 book from Make: media by Yining Shi.